Give yourself a place to set down a drink or book next to your favorite chair.The Chairside Table features a stunning Travertine stone top has natural tones and is complemented with a metal base. The base has two fixed shelves made of tubular metal slats. The Capri Petite Chairside Table w/ Travertine Top by Riverside Furniture at AHFA in the area. Product availability may vary. Contact us for the most current availability on this product. The Capri Collection creates a statement in your living room with stunning occasional tables. 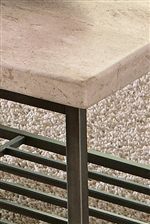 Each table is topped with a thick Travertine stone top with a neutral tone making it easy to pair with any decor. The base of each piece is made of metal leaving the base feeling open. Tubular metal slats create shelving providing storage and the perfect place to store your favorite decorative accents. The Capri collection is a great option if you are looking for Contemporary furniture in the area. Browse other items in the Capri collection from AHFA in the area.